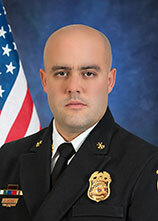 Deputy Chief David Vazquez. . .
began serving the citizens of Clayton County in 2001. He grew up in the Riverdale and Jonesboro areas and graduated from Lovejoy High School. Chief Vazquez has served as a Firefighter/EMT-I, Fire Sergeant, Fire Lieutenant, and Fire Captain/Assistant Fire Marshal, Battalion Chief of Professional Standards. Chief Vazquez holds state certifications as a Fire Inspector, Fire Investigator and POST certified Peace Officer. In 2008, he successfully completed the Clayton County Regional Police Academy and earned the Honor Graduate Award for his display of leadership and excellence. He holds an Associate and Bachelor of Science in Organizational Leadership. Throughout his career he has been awarded a Trauma Life Saving Award and a 10 year Safety Award. Chief Vazquez serves his nation as a reservist in the United States Air Force. Chief Vazquez heads the Fire Marshal’s Office and is tasked with overseeing fire inspections, new construction inspections and plan review, code enforcement and fire investigations. He is also the commander of the Tactical Medic Program, the GCIC Terminal Agency Coordinator, and POST Liaison. He takes an aggressive approach to the enforcement of fire codes and determination of fire investigations, including the prosecution of arson suspects. He cares for the protection and quality of life for the citizens of Clayton County.